This script cuts the selected tree in a user defined area and banks at the closest booth, chest or deposit box. DISCLAIMER: Woodcutting is heavily botted and OSRS is full of snitches. Bot at your own risk. Many legit players talk in the chat to try and determine if other players are bots. They report all players who don't respond but continue to play efficiently. NOTE: To Start Muling Press the green 'Start Muling' button on the bottom right of the screen. To Cancel Muling, Press the red 'Cancel Muling' button. If the script cannot bank when banking is enabled, then the current location is not supported by the RSPeer web and banking will not work. can you make a script that adds fletching as well and drops the fleteched bows, if it is a arrows shaft that will be fletched will keep? Maybe in the future but I don't plan on making a script like that right now. Thanks! Check back in a few days, it should be on the SDN by then. Thanks, I liked the concept of your woodcutting script and tried to base it off that. small issue at the wood cutting guild, it get stuck right outside the bank / deposit box house. even if the door is still open. Please fix it! What exactly does the script do? Does it walk back and forth? Does the player stand still? I think this is a simple fix but I need to know exactly what the script does when it gets stuck just to be completely sure. @Constellation I understand, thanks for the reply! Hope you get enough time to find a fix, this script is really great besides this. banking in port sarim is bugged. 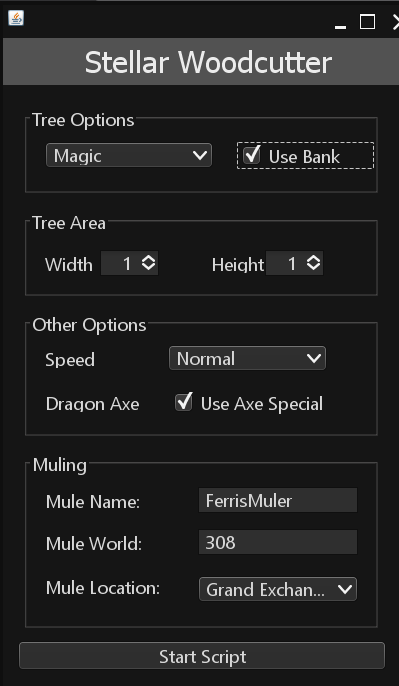 I'll add the dragon axe special for whoever want's to use it, but it won't be implemented in the upcoming update, but the one after that. Can you be more specific? What happens exactly? Does it walk back and forth between the deposit box? Note that Port Sarim does not have a bank booth. Currently only bank booths are supported, deposit boxes and chests will be added in the future. Update 0.04 has been pushed to the SDN and is now live. Update 0.05 has been pushed to the SDN and is now live. Nice job man and thanks for taking the Dragon Axe special attack into considering. Yews,magic trees are considered pretty AFK - meaning that people usually don't click another tree right away when one is cut down. Of course i can see that the xp pr hour would go down a bit. @sykrot I've noticed this too, I have a speed setting already in the script but its set to a default speed. In the next update I will add an option in the GUI to choose between four ranges of speed from fast to slow, essentially it increases or decreases the amount of time to sleep between every action. really nice bot, would give it a 7/10, would be a 10/10 if u added teak trees & made banking in possible in wc guild good job though!